At the bottom of the Garden: I feel like I just finished my final exam! I feel like I just finished my final exam! Since the first day of Masters of Education at Melbourne University way back in February 1999 - when I was just into my second trimester of pregnancy with the biggest boy, I've been working towards being able to apply to do a PhD. Circumstances led to me transferring from a research Masters to a coursework Masters in early 2000. That was a very hard decision to make, I have to say because I knew it meant I would not be eligible to apply for a PhD at the conclusion of the degree. Nonetheless, I carried on and before I finished that Masters degree I had a second baby and postnatal depression, and a deferral for six months, but eventually I did complete it. I gave up on doing a PhD for a few years, or rather I put it on the way, way, back there, back burner - something I might try again after the kids were grown. But then in 2006, I heard that the tertiary college mum was studying and working at, was offering a Masters of Arts in Creative Writing by distance education and there was talk of them offering a PhD in Creative Writing as well. I found I could get recognition for prior learning from my previous studies which would lighten the workload I needed to do for the Masters as well. Suddenly going for the PhD was back on the books. I worked my way through the second Masters and it wasn't as easy as I thought it was going to be. Of course, by now I had three boys and was pregnant with my fourth - no one can ever accuse me of making things easy on myself! I somehow managed to finish the Masters - it's all a blur now - and that was amazing to me. 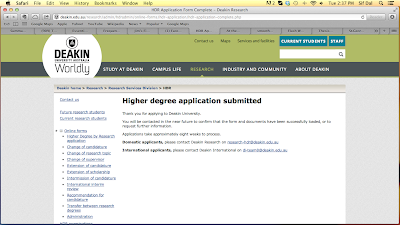 Finally, I was in a position to apply for a PhD. Applying for a PhD is not a matter of filling in a few forms and ticking of your preferences. Mum did try to warn me I would have to do a fair bit of research just to write my application - I didn't believe her (hey, that's the prerogative of the child, right?). I thought I had a topic, but after much research and soul-searching I realised I had no deep understanding of this topic or of right sort of questions to ask. So, I did more soul-searching and asked myself, what do I really enjoy in the field of writing? What is it I have the most experience with and the most knowledge of? The answer was, of course, flash fiction. When I started to look into the scholarly literature on flash fiction, I found there was a massive black hole which needed filling. 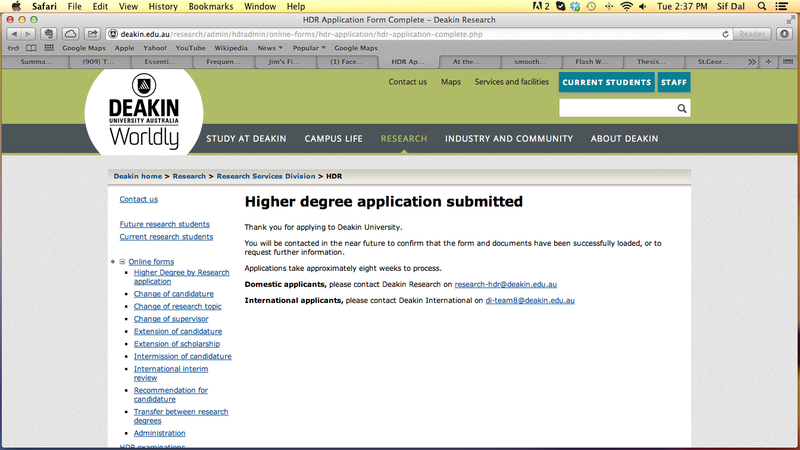 Now, I'm just hoping Deakin with allow me to start the process of filling it! Filling in the forms and gathering all the 'proof of' documents and having them copied and certified has taken the better part of a week - also because somewhere along the way I managed to lose an entire transcript! I mean, who does that??? Finally, this morning I got to click the 'submit' button on the screen and then a new screen appeared with the message you see at the top of this post. I've mailed hard copies of all the documents and sent my academic referees the forms they need to fill in and send back to the University, so now all there is left to do is wait for the result. It feels a lot like the marathon students run leading up to final exams and handing in of final assessment tasks. Suddenly I have nothing pressing for my time, but in the back of my mind there is anxiety over whether I did enough preparation, and did I dot all those 'i's and all cross those 't's? I hope I sleep better tonight than I have over the past few months. I hope it all pays off!